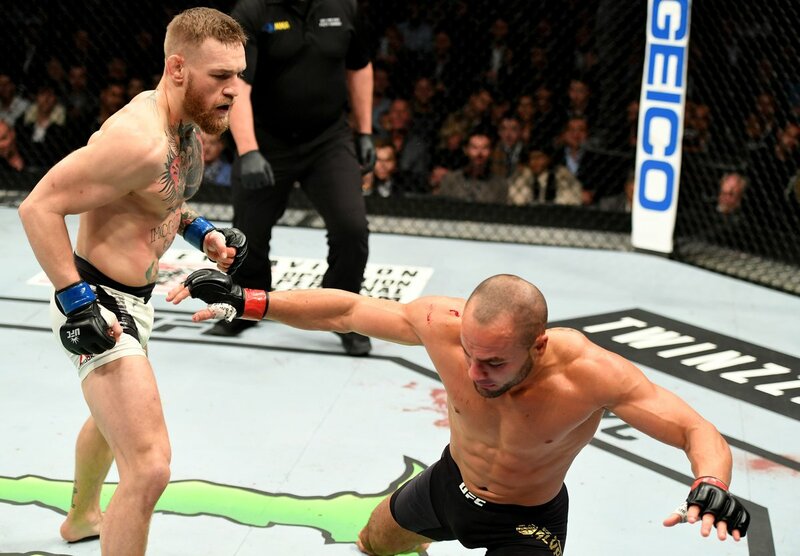 Conor McGregor obliterated Eddie Alvarez inside two rounds to claim the UFC lightweight championship and do what no one has been able to do before: hold two UFC titles at the same time. After knocking down The Underground King on four occasions while denying his takedown attempts with ease, a mind-boggling four-punch combo flattened the American for good to end the UFC's first event in the Big Apple with a bang. On a night featuring three title fights, Tyron Woodley and Stephen Thompson engaged in a war which was ruled a majority draw, as The Chosen One walked away with his reign still intact, almost finishing Wonderboy with a knockdown and submission in the fourth round. An all-Polish bout for strawweight supremacy would all go the distance as Joanna Jędrzejczyk fought off a game Karolina Kowalkiewicz, in perhaps the toughest fight of her career. She was cruising until the championship rounds but then she was rocked with a massive right hand that made for a competitive conclusion. Yoel Romero set his sights at the middleweight champion Michael Bisping after he destroyed Chris Weidman with a flying knee to spoil The All American's homecoming to New York, while Miesha Tate announced her retirement following a loss to Raquel Pennington at the start of the main card. In the prelims, Frankie Edgar prevailed in a war with Jeremy Stephens, while Khabib Nurmagomedov dismantled Michael Johnson, submitting him in the third round before a huge rant aimed at the lightweight champion.